Cowra is located in the heart of the central west of New South Wales, an easy four hour drive from Sydney and two hours from Canberra. Cowra has a wealth of country experiences, relaxing along the extensive waterways, exploring the tranquil Japanese Garden, Cowra's fascinating history, from the days of steam trains to the largest Prisoner Of War breakout in modern military history. 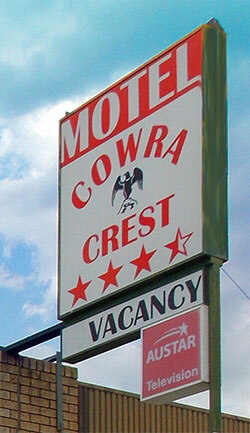 And staying in the very comfortable accommodation at the Cowra Crest Motel provides you with the great combination of the centrally located 3 1/2 star motel, well appointed including kitchenettes, quiet Daikin split system air conditioners to heat or cool, Austar Entertainment, affordable good value tariff, and surrounded by your choice of clubs and restaurants, with Woolworths Supermarket right outside the motel back gate. That's as good as it gets anywhere. But let's get on with telling Cowra's story. Food and wine buffs can tour Cowra's ever expanding vineyards to sample the superb local food and wine that is available. Where better to enjoy fine wine and delicious food, than right in the heart of where it is actually produced. Local vineyards include River Park, Mulyan, Kalari, Mulligan, Windowrie, Chiverton and many more. Plan a week-end of fine food and wine in November at the annual Food & Wine Weekend incorporating the annual Cork & Fork. Cowra is also the perfect base to explore the Central West. Centrally located, Cowra is within easy driving distance of several major tourist destinations in the central west of New South Wales. Take a hot air balloon joy flight at Canowindra - "The Balloon Capital of Australia" or visit the Age of Fishes Museum featuring ancient fish fossils as well as live aquarium displays and wonderful recreations of life in the Devonian Age. Race at Bathurst, famous to motor sports enthusiasts for its car races where you can do a lap of Mt Panorama. Orange, on the slopes of Mt Canobolas, birthplace of Banjo Paterson. Dubbo, home of the Western Plains Zoo, Parkes, famous for "The Dish" and it's telescope, Young - site of the Lambing Flat riots, Grenfell - birthplace of Henry Lawson and home of the Pinnacle Guinea Pig Races, are all nearby and offer plenty of choices for day trips from Cowra. 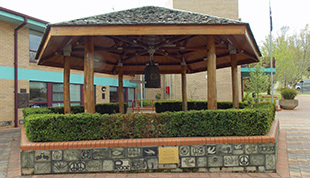 The Australian World Peace Bell was awarded to Cowra in 1992 for its long standing contribution to world peace and international understanding. 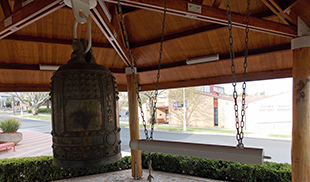 Capital cities usually reserve the right to erect the World Peace Bell, however Cowra's commitment to the World Peace Bell's objectives has meant Cowra was awarded the honour. The Bell is made of coins provided by 103 member countries of the United Nations, which were melted down and cast into the Bell. Bellevue Hill is a Fauna Reserve with wallabies, kangaroos and emus. At the bottom of the lookout there are playgrounds and free barbecues with lights that come on a night for an evening barbecue. At the top of the hill, you have a superb view of Cowra, which is nestled beside the meandering Lachlan River. 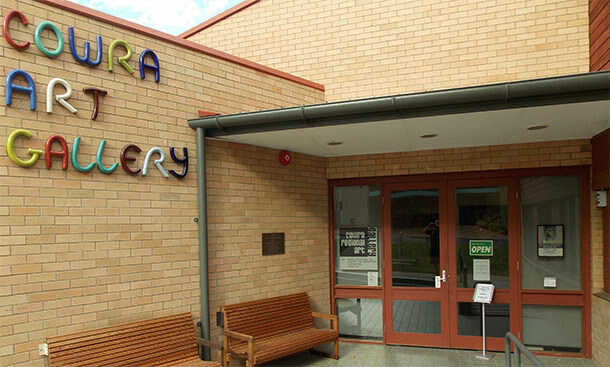 The Cowra Art Gallery is a cultural facility of Cowra Shire Council that is free to all. The gallery hosts a regular calendar of exhibitions ranging from the work of local artists to travelling works of renowned artists. Located just 4km from the town centre, Cowra Fun Museum offers an extensive collection of War, Rail and Rural memorabilia housed in a 2 acre covered complex. Special features of the museum include a Cowra POW display, 14 working stream engines, a massive model train layout and antique shop. Free guided tours are available as well as free fire engine, carousel and hay rides. Coaches are specially catered for. The Cowra Italy Friendship Monument was officially opened on Australia Day 1998 to celebrate the Italian link to Australia. 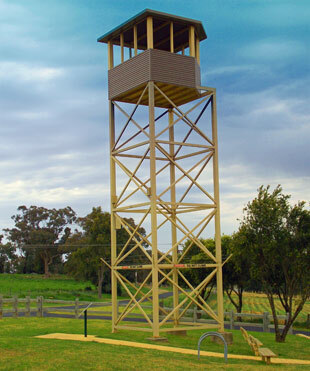 In particular it was erected in recognition of the Italians POW's and Internees in Cowra during WWII. Opened in 1979, this multi award winning attraction is a must see at any time of the year. Ken Nakajima created the Kaiyushiki (strolling) garden at Cowra, which is designed to take each visitor on a voyage of discovery. The Garden represents the landscapes of Japan where the hill is the mountain, streams are rivers while ponds are inland lakes and the sea. Special features of the Garden include: an authentic open air Tea House, a working Pottery House, Tatami room (a traditional Japanese living room) and a Bonsai House. The Cultural Centre adjoins the Garden and has two galleries featuring an extensive collection of Japanese works of art and artefacts. A third gallery houses rotating exhibitions highlighting the work of local painters, sculptors and wood carvers. Take time to explore the Garden and experience its tranquillity and beauty. Visitors are welcome to bring a picnic lunch or take advantage of The Restaurant which overlooks the Garden and offers morning and afternoon teas and lunches daily. 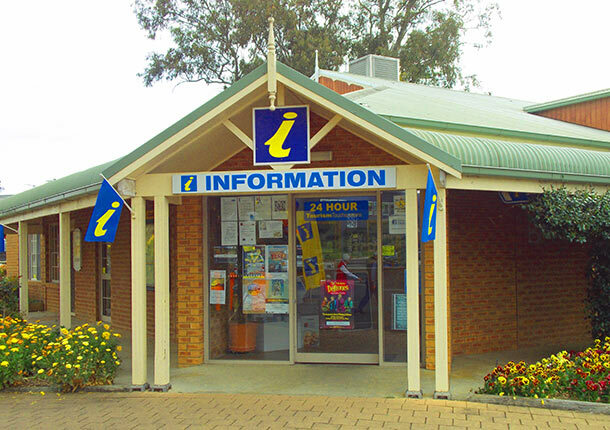 The friendly and professional staff at the Cowra Visitor Information Centre will answer all of your questions relating to Cowra and the surrounding district and supply a range of local and state information brochures. The Centre is located on the junction of the Grenfell, Young and Boorowa roads and is bordered by the magnificent Cowra Rose Garden featuring over 1000 rose bushes of in excess of 100 varieties. The P.O.W. Theatre is located at the rear of the centre. This amazing 9 minute presentation is a hologram of a young woman who tells the tragic story of the prisoner of war breakout from the Cowra P.O.W. camp during World War 2. At Darbys Falls Observatory visitors can explore the universe with one of the largest telescopes available to the public. The astronomers will show you around the night sky, pointing out the splendours of the heavens, including the Moon, planets, galaxies, star clusters, Saturn and its spectacular rings, Jupiter and its four moons and nebulae. Open every night, conditions permitting. The Japanese War Cemetery contains Graves of the Japanese involved in the POW Breakout during World War II, as well as other internees and those involved with the battle of Darwin. The land was ceded to Japan in 1963, thus Cowra has it's own little piece of Japan. A large black granite monument dominates the Cemetery and the burning of incense, wreaths and gifts can be seen at the Cemetery after Official Functions. This is the only Japanese War Cemetery in Australia. 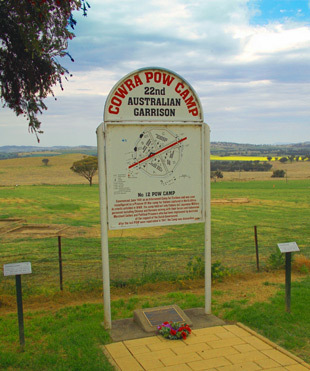 The Australian section commemorates those who died in Training at the local Military Camp, as well as the four Soldiers who were killed during the breakout. The Cowra War Cemetery is maintained by the Commonwealth War Graves Commission and has become a showpiece for modern military cemeteries. This site is listed as one of the top Heritage sites in NSW. In 1944 over 1000 Japanese POW staged a mass breakout that was the biggest in British and Australian War History. 231 Japanese POW lost their lives and 4 Australians also died during the breakout. Wyangala Waters State Park is located a short drive from Cowra at the junction of the Lachlan and Abercrombie Rivers. The lake is a clean, clear vast expanse of water with many activities available at the Park including; power boating, canoeing, sailing, water-slides, boat hire, fishing, golf courses, walking trails, children's playgrounds and sandy beaches for just relaxing on. There are also excellent picnic and bar-be-que facilities on site. For the fisherman, you can expect to catch Trout, Silver Perch, Yellow Belly, Cat Fish, Murray Cod and more.